Steven (Chicagoland, United States) on 12 January 2011 in Landscape & Rural and Portfolio. One of my larger creations after making tracks on a large blank "canvas" of snow. It took me about 10-15 minutes to make this. I could only imagine what some of the passing motorists were thinking as they drove through the park watching a man walking around in circles for 15 minutes. They couldn't see that something was being "created" in the snow as they were about 200 feet away and at grade. I actually started from the outside (so that I could see how large of a circle I could start with) and worked my way in. Then when I hit the center, I had to take large side steps into the tracks previously made. Then there was the "lollipop stick" created at the bottom of the photo. Photo captured December 27, 2010.
i love your creative streak - very imaginitive and a beautiful result! Do you do crop circle as well lol? what wan´t people to do to get a great shot! your efforts are really successful, very interesting b/w composing! wow, this is what i'd call creative, both with the mind and with the camera! and you packed it all in a wonderfully clever frame and turned it into a stunning mono! Nice. More interesting than a snow angel. 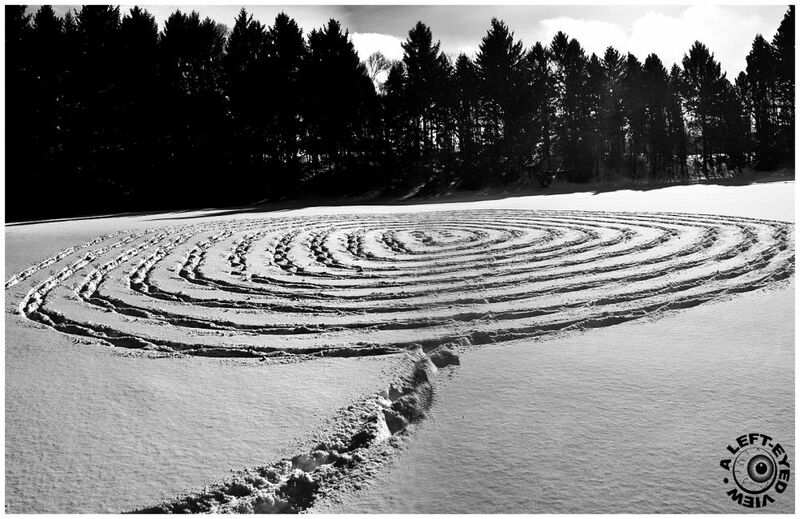 Kind of looks like a snowy labyrinth. This is EXCELLENT, Steven! I would have loved to be there and assist in some way ;-) You did a great job and once agin prove my theory about your work that it is complete, well-thought out, and always always fantastic!! Too cool! aminus had caught you doing this, would have been a hoot. Creative self landscape. I think visitors from space may have done this! ;-) Cool shot. Haha, I love this project. It is funny and playful, and the result is great. Nice photo. Love this composition! Like crop circles!!!! Wonderful light and scene! Well captured!!!! Wild Mustang beat me to it. I thought about winter crop circles. Super creative work. I love your snow filled lollipop. Beautiful capture of an of course beautiful and imaginative creation.